Internet search leader reports sales and earnings that top Wall Street estimates; stock soars as fears of a slowdown may be put to rest. NEW YORK (CNNMoney.com) -- Internet search leader Google Inc. posted a first-quarter profit Thursday that soundly beat Wall Street's estimates, news that may assuage concerns that online advertising would succumb to a U.S. economic downturn. Shares of Google (GOOG, Fortune 500) jumped more than 17% in after-hours trading on the news. Many on Wall Street had expected a weaker report from Google due to fears that the slowing economy was weighing on sales and earnings. Google reported in January that its fourth-quarter profits fell short of analysts forecasts. And shares of the online giant plummeted 36% in the first quarter as a result. 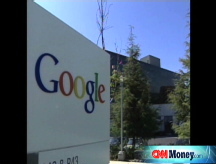 But Google's first-quarter net income rose 30% to $1.31 billion, or $4.12 per share. Excluding one-time charges, Google said it earned $1.54 billion, or $4.84 per share, beating estimates of analysts polled by Thomson Financial, who typically exclude one-time items from their estimates, of $4.52 cents per share. Sales rose 42% to $5.2 billion. Excluding advertising sales that Google shares with partners (also known as traffic acquisition costs or TAC), the company reported revenue of $3.7 billion, topping analysts' forecasts of $3.6 billion. During a conference call with analysts and investors Thursday, Google chief executive officer Eric Schmidt said he and other Google executives "don't see an impact at this time" from broader macroeconomic trends. Some analysts were worrying about a report from Web research firm comScore, which indicated that Google's paid click volume, which measures how many times people click on sponsored ads, was likely flat in the first quarter compared to the fourth quarter and might even drop slightly. To that end, Google reported its aggregate paid clicks increased 4% from the fourth quarter of 2007 and up 20% from a year ago. That's down from sequential growth of 9% in paid clicks in the fourth quarter and year-over-year growth of 30%. But Google has maintained that the paid-click slowdown can be chalked up to its efforts to improve the quality of its advertising base, kicking out low-quality or fraudulent advertisers from its system. The company has said that its plan to re-vamp its ad base has reduced the number of ads on its site, which in turn actually generates more revenue per click. "We are working to improve the quality of search with better algorithms," said Schmidt. "Fewer but better quality ads ... will lead to people spending more and more time online." Furthermore, Google completed its acquisition of of ad placement agency DoubleClick in the quarter. One analyst said that purchase will help Google expand its advertising capabilities beyond its AdSense text links. It will begin to offer more display ads (i.e. graphical ads as opposed to just contextual links) like it has with its video Web site YouTube. "Google continues to further refine its ad technologies in the display area, encouraging larger advertising," said David Garrity, director of research with Dinosaur Securities. "That will help Google outgrow the downturn in the U.S. economy." Investors in the search leader have also closely watched the number of new hires. In the first quarter, the company added 2,351 new employees - 1,500 from the company's acquisition DoubleClick, though it recently laid off 10% of DoubleClick's work force. At the end of the first quarter, Google had over 19,000 workers in more than 20 countries. Some analysts have suggested that the company is spending too aggressively on new employment, cutting into profit margins that should instead be invested on further diversifying the company beyond online search advertising. But Google's large global footprint has produced a strong source of revenue for the company. In the first quarter, international revenue accounted for 51% of the company's total sales, marking the first time in which revenue abroad surpassed sales at home. Google said one contributing factor to large global revenue was that it got a big boost from the plummeting dollar. "Now we can firmly say that Google has graduated to being a global company," Garrity said. Google's results come in a time of uncertainty in the online advertising world. Microsoft (MSFT, Fortune 500) has made an unsolicited takeover bid for Yahoo (YHOO, Fortune 500) in February, which Yahoo has since rejected. 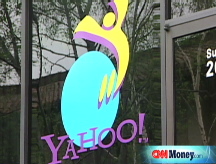 That has prompted rumors of a possible merger between Yahoo and AOL - the Internet wing of CNNMoney.com's parent company, Time Warner (TWX, Fortune 500), as well as a joint-takeover bid of Yahoo by Microsoft and News Corp (NWS, Fortune 500), which owns the social networking site MySpace. Google recently struck a trial deal with Yahoo that will place Google's AdSense search results on Yahoo's Web site. Some speculate that Google's partnership with Yahoo is an attempt to disrupt Microsoft's takeover bid, which would represent a pairing of two of Google's biggest rivals.